Craig Lenning supporting Sarah Thomas in big swells from the dinghy on Day Three. Courtesy of Elaine Howley, Lake Champlain, New York. 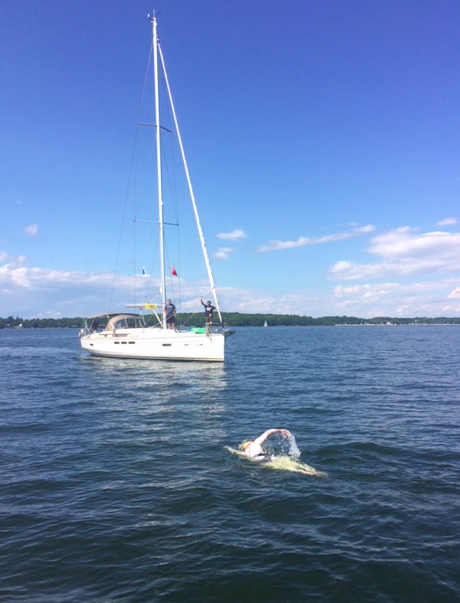 For Sarah Thomas to swim 104.6 miles (168.3 km) for 67 hours 67 hours 16 minutes on Lake Champlain in New York, she need tenacity, talent and team. Her tenacity and talent are without question. Her name is spoken in awe by marathon swimmers around the world. Sarah Thomas shortly after rounding the turn-around island and headed back to Rouse's Point on mid-day of Day Two. One of her unspoken talents is attracting a team of experienced crew members who work tirelessly to support her long swims. Each crew member has specific roles, but also enough experience to pitch in when and where necessary. Her Century Swim team included observers Evan Morrison and Elaine Howley, husband Ryan Willis, mother Becky, sister Melody, cousin Alex Thomas, kayaker Scott Olson, photographer Ken Classen, pilot Phil White, navigators Andrew Malinak and Craig Lenning, and chief encouragement officer Cathy Delneo, and course coordinator Karl Kingery. Daily News of Open Water Swimming: What was your specific role on Sarah's swim? What does that entail? Elaine Howley: Evan Morrison and I were the official observers. We were there to act as impartial witnesses and to document the swim, which we did with video, photos, and good old pen and paper. Every 30 minutes, we took a stroke count and water and air temperature readings. We also measured the wind direction and speed and recorded our GPS coordinates. We made comments in the log to record what else was going on at the time. If Sarah asked for something for the next feed, we would jot that down. We also noted when any support swimmers went out, and anything else noteworthy. Daily News of Open Water Swimming: Other than your role (as an observer/pilot/navigator), what else did you do during the swim? Elaine Howley: Elaine Howley: I also swam for about an hour with Sarah as she neared the 90-mile marker. I also spent about 6 hours in the dingy with Craig Lenning early on the third morning when the wind was so strong that the pontoon boat and the sailboat had trouble staying in the right places in relation to Sarah. During that period, I threw her feeds that had been mixed up on the big ship. But I needed to be closer to her in the little boat to ensure her safety and the integrity of the swim, so the dinghy was the best place from which to observe. 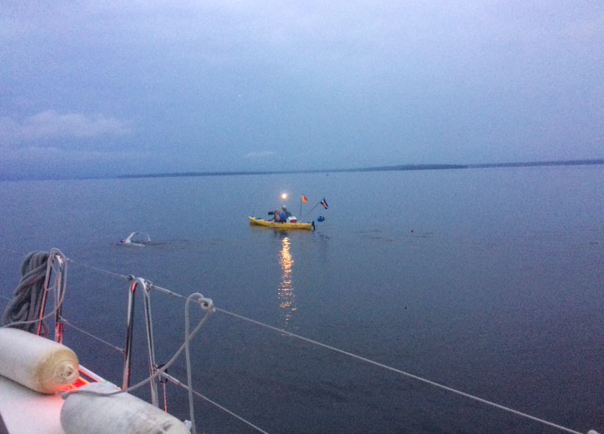 Daily News of Open Water Swimming: Were you involved in the pre-swimming planning or logistics? Elaine Howley: I was privy to the discussions around course planning, but was not a primary contributor. Karl Kingery took the lead on building a logical, repeatable, and current-neutral path for Sarah to swim. I was also included in some of the logistical planning in terms of supplies. Because I live a lot closer to Lake Champlain than most of the rest of the team and was driving up here, I was able to bring things like sheets and pillows that the crew would need. Sarah, though, was in charge of organizing everything and she had it all under control. Daily News of Open Water Swimming: Were you selected and recruited to join this support team or did you initially volunteer? Elaine Howley: Sarah had asked me to be part of the Lake Powell event last year, and I was unable to attend because of work obligations. As I was watching the end of that swim play out on Facebook Live, I determined that if she did something like this again, I wouldn't decline an invitation to be involved, no matter what else I had going on. So when we were at the 24-Hour Relay in San Francisco back in February, she mentioned to me that she was planning something big for this summer. I told her I'd be on board with it this time for sure, in whichever capacity I could be most useful. She felt Evan and I would be the best observing team, since we are so familiar with the MSF rules she would be using for it. Daily News of Open Water Swimming: When did you first commit yourself to this swim? Elaine Howley: I guess February was when I said I would be on board. 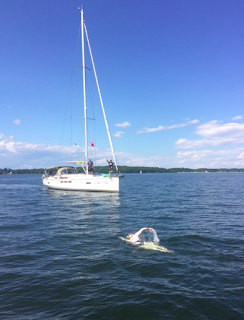 Daily News of Open Water Swimming: You have plenty of other responsibilities (Boston Light Swim + work). How did you juggle everything in order to get to the start in time? Elaine Howley: It has been a challenging couple of weeks to keep myself afloat in a sea of obligations. The Boston Light Swim is a massive undertaking, but the bulk of the work happens in March and June. Still, the week leading up to it is very busy with lots of last minute things that need to be done and that couldn't be done earlier. I would have preferred to have had Sunday to recover from that event before heading out to meet with the team for Sarah's swim, but we made it work. Andrew Malinak took the red-eye flight from Seattle on Friday night and met us on the beach at L Street in time to see all the swimmers finished. We put him to work setting up boys at the finish for the Boston Light Swim. After that wrapped up, we went back to my house and slept, then got up fairly early on Sunday and drove up to Elizabethtown, New York to meet up with the rest of Sarah's crew. We arrived just in time to go collect the rented sailboat. Most of the crew spent Sunday night on the sailboat. Sarah, her mom, sister and cousin and Evan stayed at the house and drove to the marina where she launched from. We on the sailboat got up at 5 am and motored up to meet them at the start. As for work, I worked ahead as much as I could on my deadlines. I'm producing 3 stories of roughly 1100 words each per week for U.S. News and have a couple other freelance assignments for other clients here and there. It's challenging to coordinate interviews and deadlines during a normal week, so this adventure made things even more complicated. But I love the work I'm doing, so it is not a problem to stay up late or get up early to get it all done. I did have to do some work on the boat during this adventure, as I was not quite able to get everything done before I boarded. And with that, making sure I had enough power to keep my laptop and phone charged was the biggest concern. But we worked it out and I was lucky to have cellular reception the entire way, so l managed to get it all done in the down time between observation shifts. Daily News of Open Water Swimming: Where did you position yourself during the swim? Elaine Howley: When I was on duty, I was positioned on either the deck of the sailboat or on one of the other support boats close to Sarah. The idea was to always have a clear line of sight on Sarah. When I wasn't on duty, I was either sleeping or working below deck or sitting with the rest of the crew on the upper deck of the sailboat. Daily News of Open Water Swimming: Did you ever serve as a pace swimmer? Elaine Howley: I did swim for about an hour with Sarah as she approached 90 miles. She's so much faster than me, I had to wait for her to get a little tired and slow down some to be able to keep up. Daily News of Open Water Swimming: What was your sleeping pattern and shifts during the swim? Elaine Howley: Evan and I were doing 6-hour shifts during daylight hours and 4-hour shifts overnight. He started out with the first shift so he was on duty from the start at 8:30 am until 2:30 pm. Then I was on from 2:30 pm until 8:30 pm. He picked up from 8:30 pm to 12:30 am, then I took over at 12:30 am to 4:30 am. Then he took the 4:30 am to 8:30 am shift, then I came on from 8:30 am until 2:30 pm, etc. It worked really well for us. When I came off duty, the first order of business was to get something to eat or drink and then either get some work done or take a nap. I would guess I probably got about 8 hours of sleep over the entire 67 hours. It wasn't a solid 8 hours, it was an hour or two here and there when the opportunity arose. Daily News of Open Water Swimming: Did you ever tire during the 3 days? Elaine Howley: Yes, we were all tired. But it was such an exciting event to be involved with, it was totally worth it. Daily News of Open Water Swimming: Was it fun? Elaine Howley: Yes, lots of fun. This is a great crew of fun, interesting, dynamic people, and we got along really well and got to make history together. Daily News of Open Water Swimming: Would you say this swim was the most inspirational endeavor that you have ever seen? 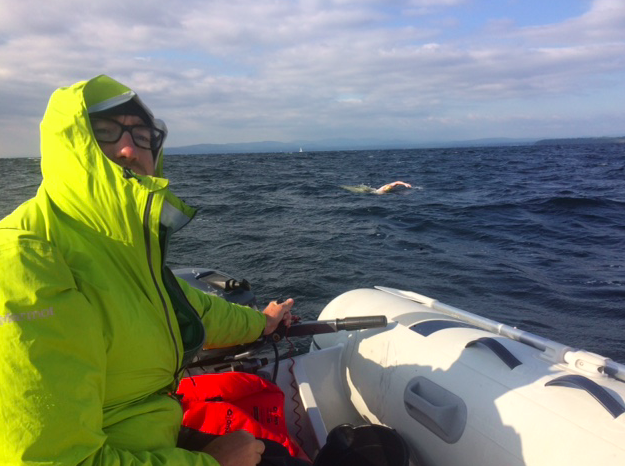 Elaine Howley: This swim was extraordinarily inspirational. Daily News of Open Water Swimming: Is there anything comparable in the endurance sports world in your opinion? Elaine Howley: I think maybe an around-the-world solo sailing event might rival this for endurance. Or maybe an Iditarod run. But it is hard to top spending 67 hours swimming 100 miles in water that is a good 25°F colder than body temperature for endurance. Daily News of Open Water Swimming: How will this swim inspire you either on dry land or in the water? Elaine Howley: I think this swim is helping me refocus on what swims I want to do next and to not fear reaching for a bigger goal. Daily News of Open Water Swimming: In one word, how would you best define this swim? Daily News of Open Water Swimming: The crew was filled with many of the greatest marathon swimmers in the world. What discussions on board were among the most interesting topics? Elaine Howley: We talked a lot about swimming and events we would like to do or have planned. But mostly, the focus was on Sarah: how she was doing, what she needed, and how we could best support her. Having that shared sense of purpose meant we had good group cohesion. Additional articles on her swim include History's First Current-Neutral 100-Mile Swim, Swimming Through The Night With Vampires, Dramatic Data On Sarah Thomas' Century Swim, and Sarah Thomas' Beamonesque Century Swim.